Glinton Sweeting O’Brien is a progressive, energetic firm with a dynamic team of attorneys and staff dedicated to providing superior legal services to our clients. We are client-focused and solutions-driven. We value the trust reposed in our firm by our clients and our community; in fact, we depend on it. Maintaining that trust is central to everything we do. No short cuts, no compromises – period. We take pride in utilizing systems and processes which are detail-driven and designed to ensure that the advice and services we provide are of the consistently high level our clients expect from us. We strive at all times to be the best: to be the valued advisors and counselors on whom our clients can rely without question. Our guiding principle is that in the end, it’s all about you, the client. We are focused on your needs here to help you solve problems and achieve your goals. Darron S. Pickstock is appointed partner. Linda Beidler-D’Aguilar Wins 2016 Minister’s Award. 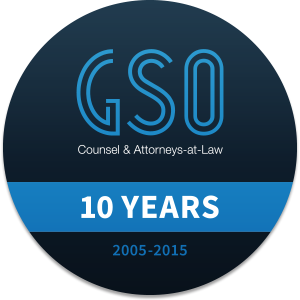 GSO celebrates 10 year anniversary. Linda Beidler-D’Aguilar joins GSO as Partner. Yolande C. Julien is appointed partner. Guarantee Title Insurance Agency Ltd. assists with the provision of title insurance for major Bahamian hotel in the amount of $449 million. Guarantee Title Insurance Agency Ltd. was launched and licensed as a title insurance agent. GSO satellite office opens in Georgetown, Exuma. GSO Corporate Services established and licensed as a Financial & Corporate Services provider. The firm becomes a major sponsor of the annual Ride For Hope event, a fundraiser for the treatment and prevention of cancer in the Bahamas. Bahamas GSO Corporate Services Ltd. was formed. GSO assumes legal representation of the Albany Project, New Providence. GSO undertakes 100 million dollar private island project in Exuma. GSO is founded by Bryan Glinton, Roy Sweeting & Andrew O’Brien.